When traveling internationally, a passport adds a layer of security by providing a means of positively identifying a person's identity. Similarly, a digital certificate or Digital ID issued by a third party, Certification Authority (CA), such as VeriSign and GeoTrust, serves the same purpose. How does a Digital ID add more security? A password is required to access a digital id's private key to apply a digital signature to a document. Only the owner of the Digital ID should know this password. Secondly, if a digitally signed document has been altered in anyway, a warning will be clearly visible. When opening the file a banner at the top says "At least one signature has problems" and/or does the signature properties field say "Signature validity is unknown" ? For security purposes, by default, Adobe automatically does not trust anyone. Upon closer inspection of the signature details, you will see a message saying "Signer's identity is unknown because it has not been included in your list of trusted identities and none of its parent certificates are trusted identities." How do I fix the banner saying "At least one signature has problems." and/or get the signature properties field to say "Signature is valid"? There are two options available. The first option is the preferred because it will only be needed to be done once. 1. The parent certificate can be added to the list of trusted identities. By default your Internet browser (Internet Explorer or Firefox) have certificates issued by many reputable authorities including Microsoft, VeriSign, GeoTrust, etc., which are automatically deemed as "trusted". If one of these companies (parent) issues a certificate to a person or company (child) they may also be trusted. 2. The receiver can use the document to load the signer's certificate can be added individually to the list of trusted identities. This option would have to be duplicated for each signer and on every computer the user may use. How do I add a parent certificate as a trusted identity? 1. Open your Adobe software and select Edit on the tool bar and then select Preferences. 2. Select Security from the left menu and then select Advanced Preferences. 3. 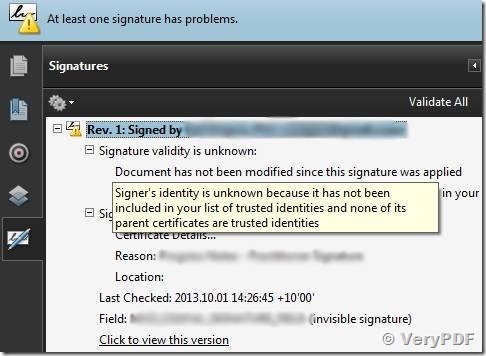 Select the Windows Integration tab and check the box for Validating Signature. If you agree to trust all root certificates in the Windows Certification Store, select OK.
How do I add a signer's identity to my list of trusted identities? 1. Click on the full size file, select the signature icon, select the signature line and then right click to bring up the short-cut menu. Select Show Signature Properties. 3. Click on the Trust tab and then select Add to Trusted Identities. 4. If you trust the identity of the signer of the document, select OK.
5. Again, if you trust the identity of the signer of the document, select OK. If my clients do either of the solutions described in Answers #5 or #6 what will they see when opening my digitally signed transcripts? This message does not indicate that the digital signature is invalid or corrupt. Instead it's a poorly worded message from Adobe that causes unnecessary alarm. If you click on the Signatures panel on the left hand side of Adobe Reader or Adobe Acrobat you will see additional information about this message. Expand the "Signature validity is unknown" field and you'll see a far more descriptive explanation of the issue. Digital signatures that were added using what's called a "self-signed certificate" — usually a certificate that you have generated yourself using a third party application — cannot be automatically validated by Adobe because the certificate is not in the list of Trusted Identities that Adobe uses to validate signatures. It's important to note that this message is not saying that your digital signature is invalid and it's not saying that the PDF has been modified since it was signed (see the text in the screenshot above: "Document has not been modified since this signature was applied"), it's just saying that Adobe wasn't automatically able to validate the certificate. You also won't be able to manually validate the signature until the certificate is trusted by Adobe. To resolve this issue you need to make Adobe trust the certificate that was used to sign the PDF. Warning: only do this if YOU trust the certificate. Don't do it for any random certificate as this can be a security issue and is not actually required if you just want to view the PDF. Click on "Show Signature Properties"
Click "Add to Trusted Identities"
Adobe Security window opens, click "OK"
If you create your certificate using Adobe Acrobat then this certificate will be automatically trusted by Adobe. It is not necessary to trust a certificate in order to be able to view the PDF. "-The signer's identity is unknown because it has not been included in your list of trusted identities and none or its parent certificates are trusted identities" indicates your co-worker needs to add something to his copy of Acrobat/Reader. What he is missing a certificate and only you can provide him with a copy of the certificate you created to sign the PDF. After you send him or make available a copy of the certificate, then your coworker will need to import that certificate into his copy of Acrobat. I'm trying to utilize our CA issued certificates for use with signing PDF documents. I have a root CA and an intermediate CA. The cert I am trying to use is issued by the intermediary CA. I can sign the pdf fine using the cert but when another user opens the document I get the error "At least one signature has problems". In the Signature Panel I see "Signer's identity is unknown because it has not been included in your list of trusted identities and none of its parent certificates are trusted identities". It appears to me I need to add either the root or intermediary CA as a trusted identity. However, when I try to add it, neither certificate appears in the list from which to choose. I'm unsure where the certs in this list are being pulled from as they don't seem to match what I see in an of the stores. I've found some info around the net on this issue but I haven't been able to pull it all together. This gets a bit complicated as there are two parts to the story. First is signature creation (a one time event) and the second part is signature validation (a many time event). When you create the signature Acrobat (or Reader) will at a minimum always add the certificate that corresponds to the digital ID used to create that signature. It will also add all of the certificates in the signing chain if it can find them. The next question is where does it find the certificates. It will look in a lot of places including the digital ID used to sign, in the Acrobat Manage Trusted Identities list, in the Windows Certificate Store or the Mac Keychain, in the Acrobat CertCache folder, other signatures, other digital IDs, known hardware devices and possibly online. The first thing it does is look to see if it can find the certificate that issued the signer's digital ID, and then recursively looks for the next issuing cert until it either finds a self-signed certificate or just can't find it. Now when you sign all of the available certificates and revocation information will be included in the signature. At this point you have to trust (no pun intended) that whoever receives the signed PDF knows how to add at least one the certificates in the signing chain to the their list of Trusted Identities. How can I have a PDF which people can sign and submit on my website? This entry was posted in PDF Security and tagged pdf certificate, pdf signature, pdf signer, pdf signing, sign pdf. Bookmark the permalink.